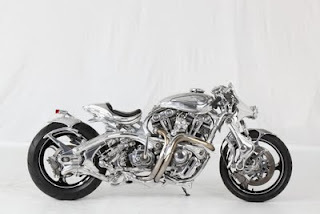 Japanese bike builder Ken Tabata came to Sturgis as an unknown to win the 2011 AMD World Championship of Custom Bike Building, on Wed., Aug. 10th. Tabata of Tavax Engineering, Yao City, Osaka, worked for more than 3 years on "TAVAX 2011V," a bike with dynamic movement and power, "designed to look like a Cheetah about to pounce." Top 3 in the Freestyle class: Satya Kraus of Kraus Motor Co (left) (3rd place), newly-crowned World Champion Ken Tabata of Tavax Engineering (center) and Larry Houghton of Lamb Engineering (2nd place). Click images to enlarge. TAVAX2011V effortlessly combines sculpted aluminum bodywork with one-off hand-made pieces that form the suspension and replace the stock engine and transmission covers. At the rear of the bike the swingarm pivots from behind the rear cylinder, arcing over the transmission, and carrying a linkage system operated single shock, a design similar to that found on many modern sports bikes. At the front of the machine the suspension begins at the axle as a leading link fork, which then changes via a pair of links to finish as a Springer fork. 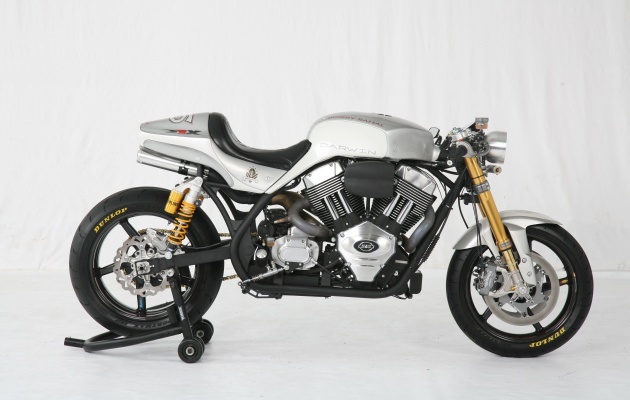 To demonstrate the performance potential of his bike Ken has forgone tall and wide wheels, favoring instead a pair of Marchesini 17in sport bike rims carrying floating rotors and Lockheed brake calipers. Taking a less complex styling route, Larry Houghton, of Lamb Engineering, secured second place with Son of a Gun. 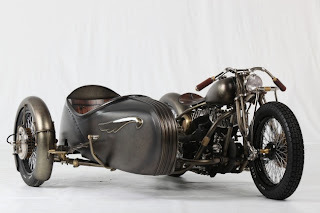 Based around a 1951 BSA single cylinder engine (found on eBay) and Talon motocross wheels. Larry built the rest of the bike himself, often collecting material from the scrap bins of friends in the engineering trade. 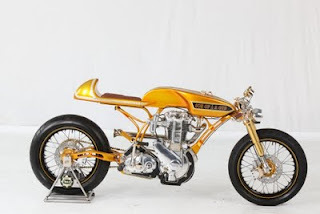 His careful recycling of material meant that he was able to build a World Class custom motorcycle for less than $9,000, including the gold candy silver metalflake paint wrap. Third place winner Satya Kraus believes in the bare essentials, aptly demonstrated by his entry, "Bolide." He achieved his aim by putting a 93ci S&S Shovelhead motor in a one-off frame carrying a mono-shocked swingarm, telescopic forks and 17in Alpina spoked wheels shod with Metzeler sport bike tires. 1st Place - Performance Custom Class was won by Jim Giuffra and the girls of AFT Customs, who rebuilt a 1970 Honda CB750 café racer styled custom, complete with RaceTech suspension, Beringer brakes and numerous one-off pieces. 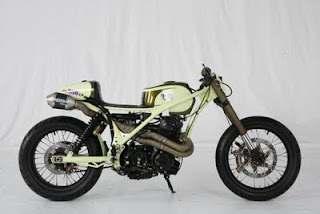 1st Place, Production Class: The influence that café racers are having on the current custom scene can also be seen in the design of the top placed Production Manufacturer class bike. 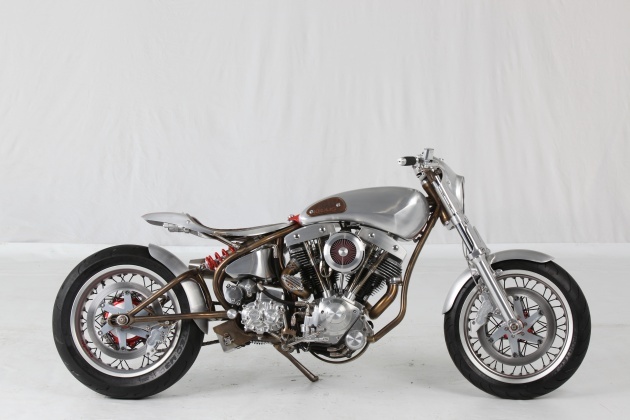 Best known for its line of Chops and Bobbers, Darwin Motorcycles has built what it describes as an American muscle bike. Powered by a 132ci S&S X-Wedge V-twin, the RLX carries a full range of top spec components including Öhlins suspension, Beringer brakes and BST carbon fiber wheels. Italian Sidecar Bike wins AMD Modified Harley Class: A first in 2011 for the World Championship was the entry of a sidecar outfit and it was this outfit, Abnormal Cycles' Union, that took the honors in the Modified Harley class. The Model 'U' powered outfit features a stock frame fitted with a custom sidecar body and a leaf spring Indian style front end, which includes a pair of handlebars created to also look like a leaf spring. The World Championship of Custom Bike Building exists to showcase and promote international custom motorcycle design and engineering quality, craftsmanship and innovation; and to promote the evolution of custom motorcycling in ways that will help secure the unique enjoyment of custom motorcycles for future generations of riders. The World Championship is a free-public-admission four-day event that opens on the first Sunday of the Sturgis Motorcycle Rally, culminating in an awards ceremony at 3:00 pm MST on the Wednesday of the Rally. The whole event, including the awards ceremony, is broadcast on the internet and you will find photos of all of the top bikes at www.AMDChampionship.com.